We recommend you to book our hotel through our website You won’t find better conditions, prices or offers with travel agencies or other websites. Nevertheless, for your peace of mind, if you book on this website and then find a cheaper price elsewhere offering you the same as you booked with us, contact us, tell us where this cheaper price is published and, after checking it, we’ll meet it. 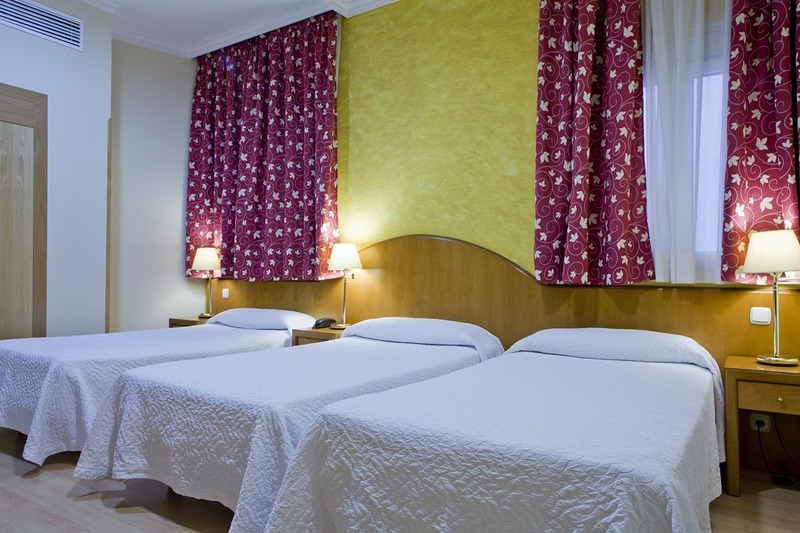 Single rooms at Hotel Europa are fully equipped and decorated with warm tones to provide maximum relaxation and well-being to our guests. 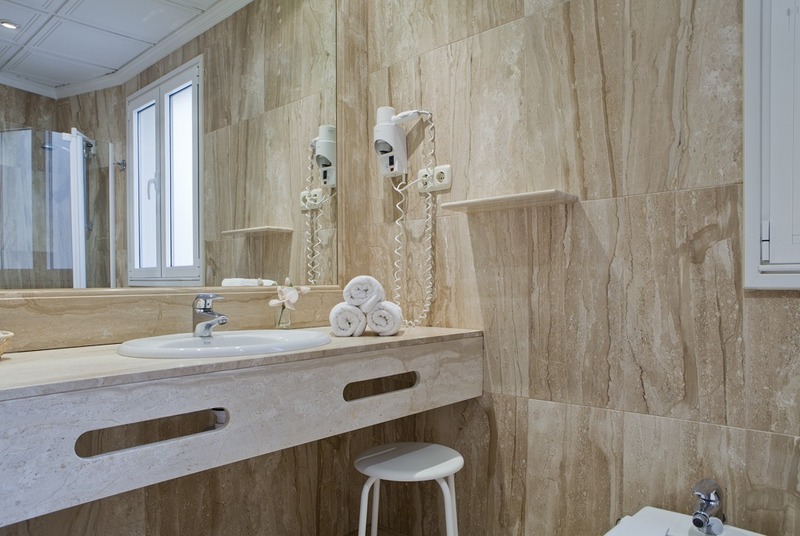 All our rooms include a complete private bathroom with hairdryer, TV-radio with international channels, direct telephone line, free safety deposit box, mini fridge, heating and air conditioning, free Wi-Fi Internet connection and room service. 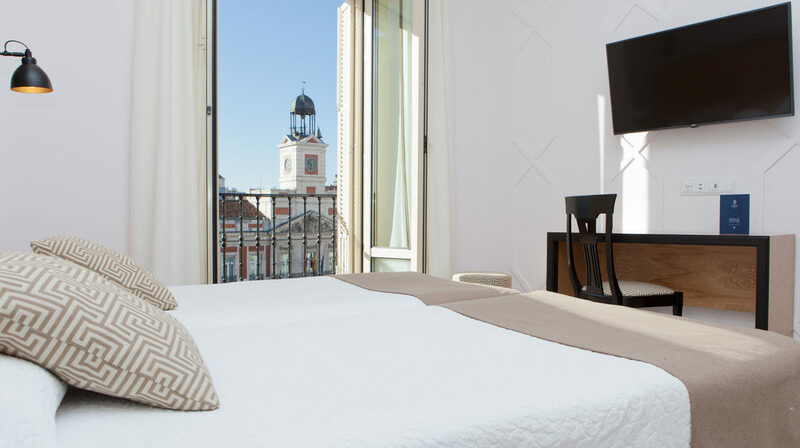 These rooms have views of our domed courtyard or Calle del Carmen. These rooms are fully equipped and decorated with warm tones to provide maximum relaxation and well-being to our guests. Recently renovated, they include a complete private bathroom with hairdryer and magnifying mirror, TV-radio with international channels, direct telephone line, free safety deposit box, mini fridge, heating and air conditioning, free Wi-Fi Internet connection, room service, multi-plug socket, HDMI connectors, kettle with welcome tray and amenities. They also offer fantastic views of Puerta del Sol. Double rooms at Hotel Europa are fully equipped and decorated with warm tones to provide maximum relaxation and well-being to our guests. 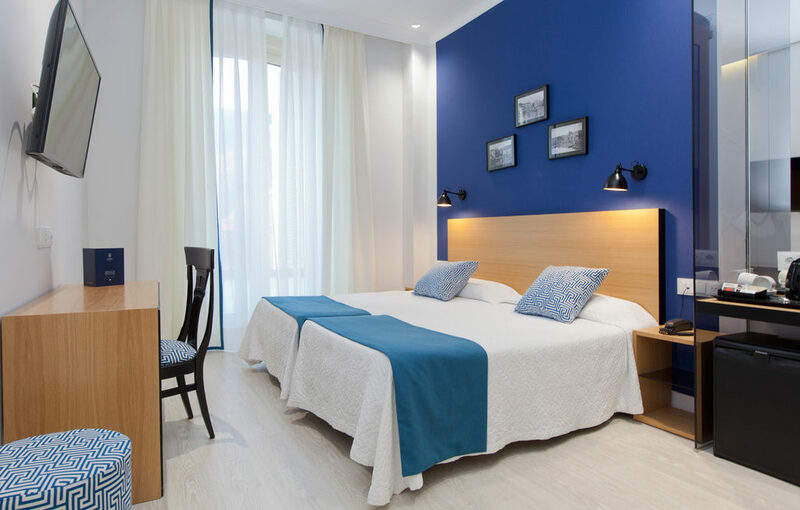 All our rooms include a complete private bathroom with hairdryer, TV-radio with international channels, direct telephone line, free safety deposit box, mini fridge, heating and air conditioning, free Wi-Fi Internet connection and room service. These rooms have views of our domed courtyard or Calle del Carmen. Triple rooms at Hotel Europa are fully equipped and decorated with warm tones to provide maximum relaxation and well-being to our guests. 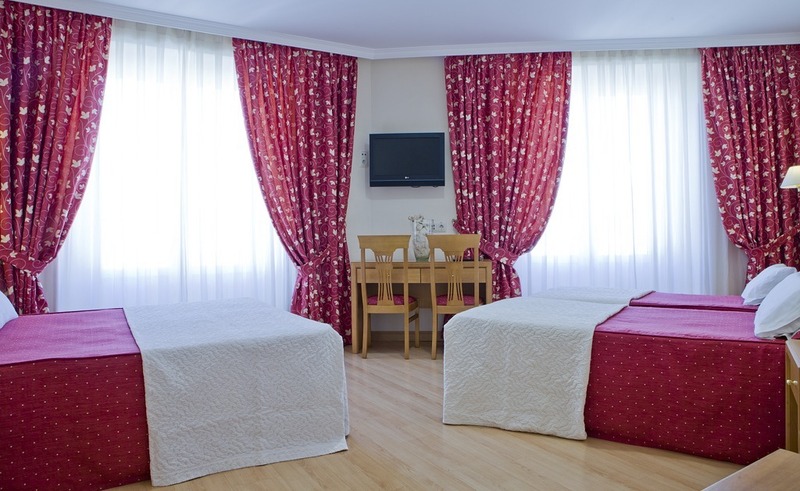 All our rooms include a complete private bathroom with hairdryer, TV-radio with international channels, direct telephone line, free safety deposit box, mini fridge, heating and air conditioning, free Wi-Fi Internet connection and room service. These rooms have views of our domed courtyard or Calle del Carmen. 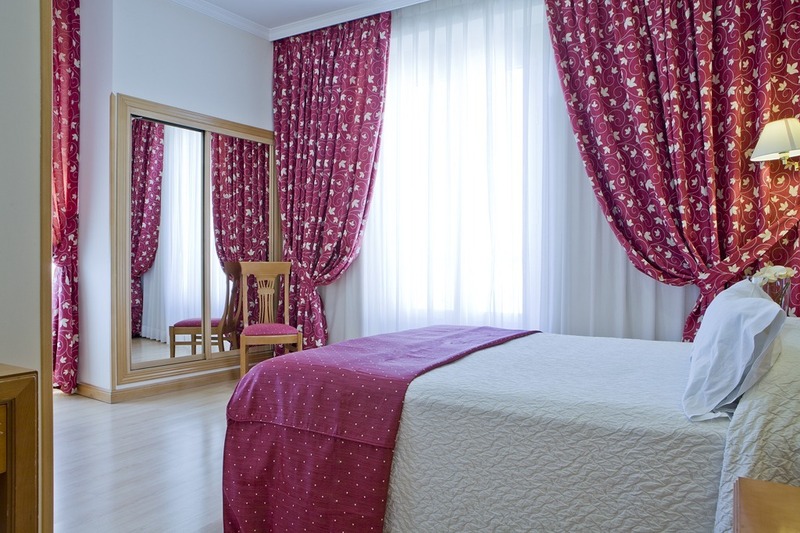 These rooms are fully equipped and decorated in warm tones to provide maximum relaxation and well-being to our guests. 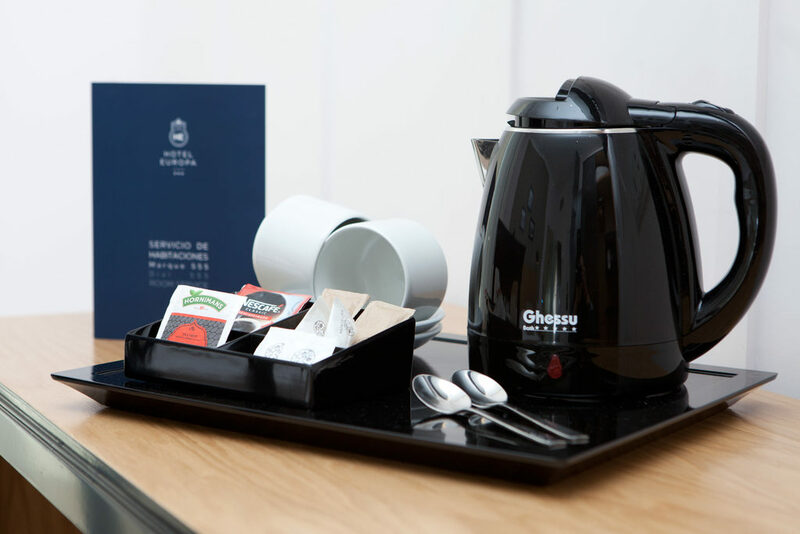 All our rooms include a complete private bathroom with hairdryer, TV-radio with international channels, direct telephone line, free safety deposit box, mini fridge, heating and air conditioning, free Wi-Fi Internet connection and room service. Double bed available subject to availability. The rooms have views of our domed courtyard of Calle del Carmen. The Suite includes two independent bedrooms and two bathrooms, with maximum capacity for 4 people. They are fully equipped and decorated in warm tones to provide maximum relaxation and well-being to our guests. All our suites include a complete private bathroom with hairdryer, TV-radio with international channels, direct telephone line, free safety deposit box, mini fridge, heating and air conditioning, free Wi-Fi Internet connection and room service. The Suite has views of Calle del Carmen.